This PDF 1.3 document has been generated by Aspose Ltd. / Aspose.Pdf for .NET 10.9.0, and has been sent on pdf-archive.com on 06/10/2016 at 21:29, from IP address 209.58.x.x. The current document download page has been viewed 190 times. File size: 3.1 MB (61 pages). analysis, and electronic evidence recovery. Sections 1030(aX5)(A), 1030(b), and 1030(c)(a)(Bxi) (the &quot;Subject Offense&quot;). and poodlecorp.org (Subject Domain 4) (collectively, the &quot;Subject Domains&quot;). each and every fact known to me concerning this investigation. those facts that I believe are sufficient to establish probable cause. properly directed from its source to its destination. 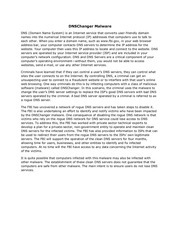 e-mail servers which act as a post office to send and receive e-mail messages. example, &quot;usdoj.gov&quot; is a domain narne. Mexico, and &quot;.me&quot; is a top-level domain for Montenegro. who used their domain name registration services. 'AppleJ4ck,&quot; whom the FBI has identified as Individual B.
in the Northern District of Illinois. payment card information for thousands of victims. affrdavit. SeePart II(I) and (J). used to disseminate information about phonebomber.net. of the attack. . . .
phone numbers currently being called, and the last 30 days of targets. Rest assured your privacy is respected here and purchase in confidence. a resident of the Northern District of Illinois, was the &quot;first victim&quot; of the service. This file has been shared by a user of PDF Archive. Document ID: 00492039.